Mohan Babu, Vishnu and Manoj team up for a multi-starrer! The trend of multi-starrers in Telugu is gathering steam in Telugu film industry post the success of Seethamma Vaakitlo Sirimalle Chettu and now it seems to be on an overdrive. 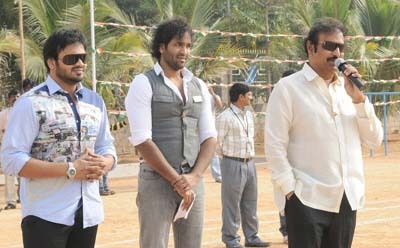 For the first time ever, Mohan Babu and his sons Vishnu Manchu and Manoj Manchu are teaming up for a multi-starrer film. This untitled film also stars Varun Sandesh, Tanish, Raveen Tandon, Hansika and Pranitha in lead roles. Sreevas, who had earlier made Lakshyam and Rama Rama Krishna Krishna, is going to direct the film and it’ll be jointly produced under Sree Lakshmi Prasanna Pictures and 24 Frames Factory banners. For the first time ever, Manoj Manchu and Vishnu Manchu are collaborated to produce a film. The film will be officially launched on April 21. Kona Venkat, Gopi Mohan and BVS Ravi are writing the script and as many as four popular music directors are going to be roped in to score the music. Palani Kumar is the cinematographer. Vishnu Manchu’s daughters Ariana & Viviana are going to present the film. “It’s a hilarious family entertainer and we are quite confident that we’ll meet audience’s expectations. We are producing a film together for the first time and it’s an honour to be producing a film along with our father who introduced us to cinema,” Vishnu and Manoj Manchu told the media. More details about the film will be announced soon.